Position a rack in the center of the oven and heat the oven to 375°F. Brush the beef with 1 Tbs. of the oil and 1 Tbs. of the vinegar. Season the beef all over with 2 tsp. salt, 1 tsp. of the rosemary, and 1/2 tsp. pepper. Toss the onion, fennel, and potatoes with the remaining 2 Tbs. oil, 1 Tbs. vinegar, 1 tsp. rosemary, 1/2 tsp. pepper, and 1/4 tsp. salt. Spread the vegetables over the bottom of a9x13-inch Pyrex dish. Nestle the roast, fat side up, in the middle of the vegetables. Roast the beef until an instant-read thermometer inserted in the center of the beef registers 125°F for medium rare, 1-1/4 to 1-1/2 hours. Transfer the beef to a cutting board to rest for 10 min. Meanwhile, raise the oven temperature to 450°F. Give the vegetables a stir and continue to roast them until they are browned and tender, about 10 min. more. Thinly slice the beef, sprinkle with salt, and serve with the vegetables. No fennel bulb available, so I subbed in sliced carrots and parsnips. I had to double the portion of oil & vinegar to coat the vegetables, possibly due to larger volume of vegetables. I also had to use a bottom-round roast, but otherwise cooked as directed. This was great!! 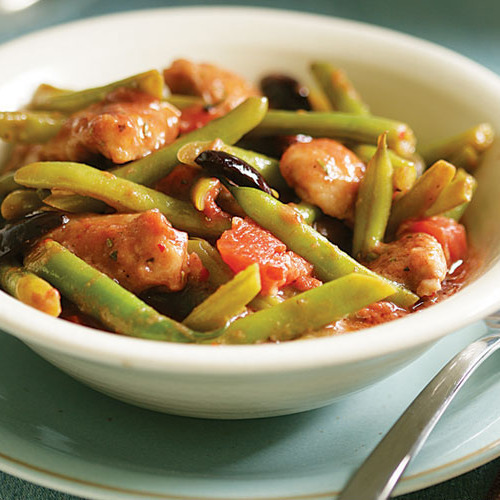 I love one-dish meals, and this one comes together quickly and easily! The glaze on the vegetables was so yummy even the non-vegetable lovers in my family ate them. Even better with a bit of horseradish sauce on the side for the beef. This recipe is definitely on the list to make again! Comfort food at its best! Totally fool-proof,so you absolutely can't go wrong. 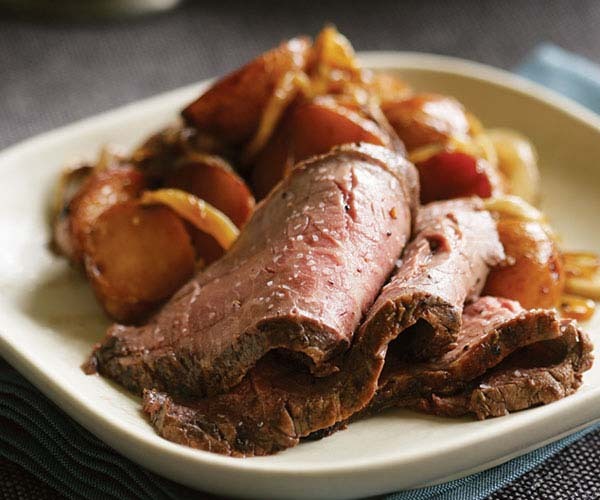 I made this with an inexpensive bottom-round roast, and I substituted some of the vegetables for onions, carrots, sweet potatoes, and broccoli -- in other words, I cleaned out my produce drawer. The balsamic glaze was wonderful, as it sweetened the veggies enough to get a few down my young son, but it wasn't too cloying for the adult palate. Yes, I'll make this again!